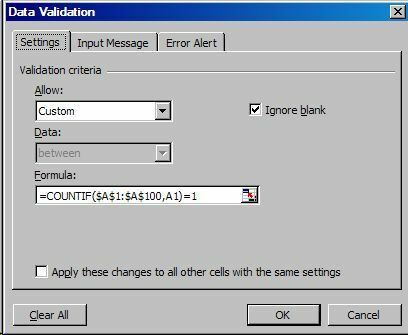 If you are familiar with the Excel Data Validation feature, we can move into a great use for it! That is, prevent duplicates in an Excel Spreadsheet. Let us assume the range we want to prevent duplicates in is the range A1:A100. 2) Go to Data>Validation and choose "Custom" from the "Allow:" box on the "Settings" page. 4) Optional: Click the "Input Message" page tab and enter a message that the users sees each time they select any cell that has this Validation applied. a) Stop: No user will be allowed to enter data that already exists. They will have the choice to Retry or Cancel. b) Warning: User will be allowed to enter data that already exists, but only after confirming the entry by clicking "Yes" on the message box they are shown when entering duplicate data. The default button is the "No" button and they also have the choice of clicking "Cancel"
c) Information: User will be allowed to enter duplicates after confirming the entry by clicking "OK" on the message box they are shown when entering duplicate data. The default button is the "OK" button and they also have the choice of clicking "Cancel". Once we have done this, we simply click OK and we are done. Now test it by entering duplicate data.